Siesta Key is an 8 mile long barrier island located offshore from Sarasota Florida. This Island was founded in 1846 and currently has more than 24,000 residents during the winter months. 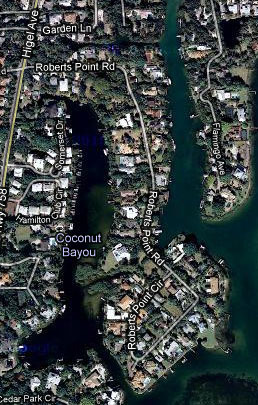 Roberts Point is a Siesta Key neighborhood with less than 100 residences located on the northern part of the Island. Some of the finest residences in all of Sarasota can be found in this community. If you are looking to acquire one of the finest residences that can be found on Siesta Key, Roberts Point should be on your list. Roberts Point is almost completely surrounded by water which appeals to people who enjoy boating and water sports. The waterfront residences have access to Roberts Bay and the Gulf of Mexico via Big Pass which is located on the north side of the Siesta Drive causeway. The waterways are deep and many of the homes can accommodate sailboats and large yachts. Roberts Point is a very quiet and private Siesta Key community filled with estate homes and stylish properties. The landscaping on Roberts Point is quite lush and tropical; there is no shortage of flowering foliage and exotic trees in this area of Siesta Key. The waterfront homes have breathtaking views of the surrounding area and Roberts Bay. Roberts point homes for sale range in price from $450,000 for the older original homes to $8 million for the newer palatial residences along the water. Every price point in-between is represented on Roberts Point, if you are a more affluent home buyer there certainly will be a price and style that appeals to you. The floor plans of the homes range from 1,500 square feet to nearly 8,000, the larger homes feature the finest lifestyle amenities that can be found on Siesta Key. Below are all of the current real estate listings available for sale in Roberts Point as of 6AM this morning.